I think that’s what everyone else is thinking too. Big if true, thanks Coach. You got them power ball numbers? Asking for a friend. DM me. He hired Shea Patterson's lawyer who got Patterson a waiver. He's going to try to challenge the rule based on being a victim of racial intimidation/harassment at UGA. The prevailing thought is that the NCAA won't have the stones to deny him based on something that sensitive. The most surprising thing about this tweet is that I had no idea JK was that short until I looked it up. So have I. I've stood directly next to both Martell and Troy Smith. I'm 6'1", and Martell, using my 6'1" frame as the standard, was as tall as Smith, who's listed at 6'0" but is nowhere near that tall. I'd say Tate is 5'10"-5'11". Listen, he's an elite athlete who had the balls and commitment to wait his turn behind Barrett and Haskins, which is more than can be said for Fields. To be clear, I'll be happy if Fields comes to Ohio State, but I do not believe that he will automatically beat out Martell. I mean, Tate Martell was on the same level as Fields as a dual threat QB recruit and he's already been in the program for two years. Lots of quarterbacks are short... Russell Wilson, Drew Brees, Doug Flutie, Kyler Murray (who was said to be 5'9" during the Heisman insanity)... but Martell has the 'it' factor, just like the four aforementioned guys. I cannot understand the doubt about Martell on this site. I have no idea where that comes from. I look forward to seeing his 'IT' factor dominating at the collegiate level. No doubt the kid is a special talent by what we know for sure. I think Fields transferring in would propel Tate to even higher levels of hard work and determination. Only good things can come of Baldwin and Fields battling Tate for QB1. The only comparison between fields and Tate are they both played highschool football. Fields is going to be handed every opportunity to live up to his hype where Tate is expected to keep that clipboard in his hand. Tate could be a brees I don’t know, I wouldn’t count him out but it’s not looking like we are going to find out what he’s capable of in a Buckeye uniform given the way this post/offseason is trending. Maybe you're taller than you think, Kmp. Smith measured in at exactly six foot even at the NFL combine in socks. Fellas, I stood side by side with Troy Smith at the 07 national championship game in New Orleans and he was much shorter than me. I certainly can't dispute the combine numbers, but the Troy Smith I met that evening looked a good amount shorter than 6'0". I read not long ago were players guzzle gallons of water, put orthopedics in their socks, and do special neck exercises to manipulate their true height and weight before the measurables at events like the senior bowl and/or the combine. I don't know, but I do know what I saw that night by the Superdome. Spot on! I've personally been looking forward to seeing Tate having a full shot to prove himself. He's been a hell of a Buckeye and cannot ask much more from a guy with his accolades coming in, learning the system, being a great representative of the University on and off the field. I'm sure that's what most Georgia fans would have preferred with Fields. Bide your time, earn it, and take advantage of the opportunity when it comes. I don't see any chance that Tate is not successful and I'd hate to see him on another sideline across from our beloved Buckeyes. He'd have a hell of a chip on his shoulder. Tate, Baldwin and Fields, by CFP committee standards, I'm sure would all pass the "Eye Test" in a Ryan Day Buckeye Offense. Let the best man win the job and the other pieces fall where they may. Still much respect for Tate and how he chooses to handle these rumors and waves of negativity. I think the same. Murray is probably even shorter and look what he has done. Martell brings a mixed bag of it all. And he will not hesitate to run and he can run with them. His only downfall at this level is what his strong point is. He is a fighter. He won’t back down. And that could get him killed..LOL...So it’s good to have a stacked QB room. But I think he is a good one. Archie wasn't very tall either. Or should I say he was just as short. Did that hamper him? That's what Texas and Texas A&M said when Brees tried to get an offer from them. Kyler Murray is a good inch shorter than Tate. We’ll be alright. yeah we will, since he wont see the field. Upvotes because so many people missed the obvious sarcasm. Troy Smith would like a word. He only won the Heisman his final season here. If Tate were playing TE or WR I'd be more concerned about his height but not at QB. He'll be fine. Troy was 6'0. I don't care what the media guy says, Tate is like 5'9 at best. Tate is listed at 5'11, not 5'9. Maybe actually post facts next time. That's only 1 inch shorter than Troy. ..and the whole O-Line about the same? Came in a little hot there boss. Colleges lie sometimes. I was listed as 6'4" in college and I'm barely 6'2" on a good day. Sometimes genius is misunderstood. Good show Juice. You're more than welcome to try, but should probably build a nice base of HS first. Some might people on this site are a bit sensitive. I don't think it is. I for one have never made a sarcastic comment in my life. "we" won with troy smith. Feel like Baldwin is going to give Tate all he can handle in this competition. I'm sure he will but I still think Tate wins the job. If Fields ends up coming here there's a good chance Baldwin might end up being third string again. Let’s be real here. If fields shows up on the roster then tate picks a new team to play for. 100 percent correct. Baldwin stays and Mathis is redshirted creating distance between him and Fields. Miller not really affected. If Fields would win the job you would be correct. But he won't leave just because Fields shows up on the roster. Don't they have like four games into the season to transfer now? I can't understand why people think that a kid that has never lost a game, was the National player of the year in high school can't play. At least wait till he plays a game before writing him off. Stop sleeping on Chris Chugunov, guys! Forgot about that guy. Wonder if the coaches have as well /s? Kind of strange timing for this with all the Justin Fields stuff out there. I think the Martell vs. Baldwin debate is interesting, BUT the Fields vs. Martell vs. Baldwin debate is even more interesting. Do we really want QBGeddon II? Here's my thought. When it was Cardale vs. JT Urban Meyer handled that situation very poorly. My POV on it was that he seemed to gun shy to damage either guy's ego (or perceived ego) and didn't want to commit to one guy fully. I think a QB-Geddon II really wouldn't be a problem as long as Coach Day identifies his guy and sticks with him and makes that player give him a reason to take him off the field. It wasn't so much the JT/Cardale situation it was how the staff handled it and wouldn't go all-in on one guy. If Day handles it like that, then it could be an issue for sure. Otherwise, it's just the Buckeyes landing a transfer from a very good player. Hey, that's just opportunity granting you the chance to up those Helmet Sticker numbers! when a leader chooses bases on his preferences instead of criteria [principles in common]... he paints himself into a corner be cause we all have personality preferences which degrade our 'objectivity'. this condition of ours makes decision criteria 'relevant'... and reveals biases behind preferences. These are the major rational factors in assessing 'credibility'. Honesty, not favor is the leader's foundation for his Integrity. Leadership is not a popularity contest, nor who's the best BSer. NB also that BSing the opponent [aka Deception]... is the greatest force multiplier! c/f BSing your self and/or your teammates... ifs often fatal suddenly, and scatters 'honesty'...into fratricide. Don't pick a fair-whether friendly for foul weather during hunting season. Where are we starting QBGeddon? if QBG1 is Cardale vs JT, then isn't QBG2 Haskins vs Burrow? making Martell vs Baldwin (vs Fields) QBG3? Haskins-Burrow wasnt even close to the original. There were at least 50 threads that popped up July/August 2015 and those are the ones I can remember. Never rule out Tate- he will compete. Never rule out anyone that has the desire. Its either going to be here or another team, but Tate Martell is taking a team to the college football playoffs. Might as well say the exact same thing for Fields. They both are "THAT" good. Well let me stop ya there because it's not a certainty he would have to sit out a year. Off topic a bit, but guaranteed Tate gets a TD pass in the Rose Bowl. 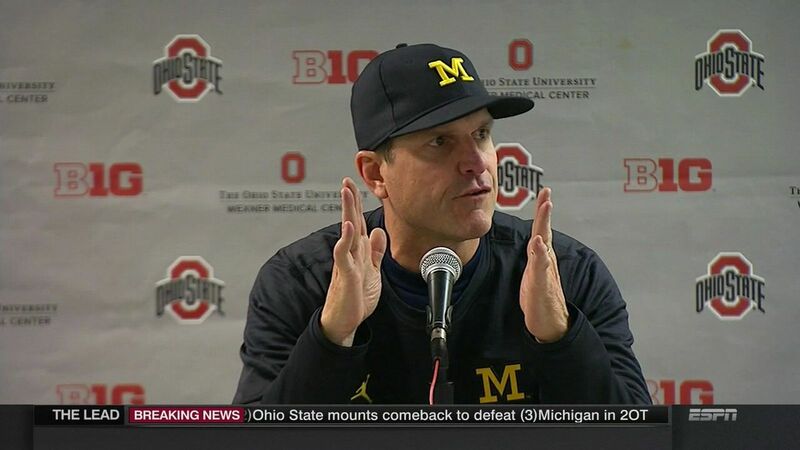 I think UFM was setting things up when he had Tate in at the goal line against ttun and ran the ball every play. If they are in that situation in Pasadena, I can see a play action run with either a jump pass or a TE leaking out. Just bringing this up, because some solid play by Tate in the Rose Bowl may change some of the narrative. I truly hope, when Tate Martel gets his opportunity, that he makes absolute fools out of some of you boneheads. Probably the same folks that bad mouthed Haskins when he pulled a little mop up duty behind Barrett by running into the line time and time again. Good grief, give the kid an opportunity to prove himself before you write him off! Awful ironic the volume of “Tate waited his turn” comments, where with other guys (who did the same) they were said to be playing because of seniority and blocking the PT of the young pups. Nothing like shifting narratives dependent upon who is being talked about. Lol! As surprised as I was with Deayne’s passing abilities, I was even more mystified by the disappearance of the running game. Common sales tells me that a good passer would automatically improve the rush offense since the opponent can’t key in on the run. i personally couldn’t care less who Quarterbacks for us as long as they don’t throw picks like candies in a carnival. Ohio St was never the QBU. I would rather want an OL that can run block along with a good game manager QB who can make some clutch throws. The running game struggled some because teams sold out to stop the run and made Haskins beat them all by himself. Luckily Dwayne and our WRs had the talent to do it. I just started reading about Field's transfer. Has there been articles (quotes) concerning Field's interest in OSU? I was under the impression he would need to sit a year. Those 2 points would make most of these comments irrelevant 1. If he has shown no interest 2. He sits a year. Nvm, I'm up to speed now. Still too many questions though. We need a little more excitement. "Pressure....continual opportunities for others to see our true character."